Helene Garrovillo, Managing Director of Heart of the Mother Retreats, has been a gifted intuitive all her life. Having no context in western culture for how to work with her gift, and finding herself often overwhelmed in the midst of a world filled with suffering, she began to seek greater understanding and wisdom. Immersing herself in exploring the world’s great wisdom traditions, she longed to experience the truth that she knew deep inside: there is something in the universe much, much greater than us. One day while browsing in a bookstore, Helene picked up a copy of National Geographic Magazine, and found an article about Ayahuasca. Though she had never heard of the Medicine before, she was immediately called to travel to Peru to experience it, and began making her plans. Having a career as an executive chef, she found herself surrounded by intense competition, and she longed to release the self-judgment and insecurity she experienced in that environment. She intended to heal that as she journeyed to Peru, and to find greater balance, self-acceptance, and peace of mind. Over the past decade, Helene has travelled to Peru numerous times to work with mentors, shamans, and medicine men and women. She found not only the healing she longed for, but much more. Coming into deep self-love, understanding, and compassion, she has cultivated a presence of unconditional love and openness that surrounds her in a palpable way. The Medicine continues to support her in cultivating her innate healing and intuitive gifts, and she experiences great joy in supporting others in aligning with their true nature and divine path. Whether with a client, or the person beside of her in line at the supermarket, Helene supports people in cultivating a sense of mindfulness and peace, learning to trust their own inner guidance, and ultimately, empowering them to live inspired, authentic lives. While there are many paths to truth and healing, Helene has found her own path most aligned in working with plant medicines. 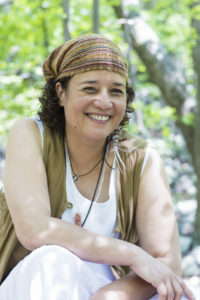 She created Heart of the Mother Retreats because she wanted others to experience the gifts of the Medicine in a safe and loving container, while also experiencing the energies of sacred ancestral lands. As a master chef, Helene consults with our retreat centers in creating delicious and healthy menus that support the radiant health of our participants while also following the specifics of the recommended diet protocol for our work. Helene brings people together in community to enter into deep trust – trust in oneself, trust in each other, and trust in the process through formal and informal sharing and holding the space of presence for each other. Helene balances a full life of creating beautiful food, facilitating workshops, supporting clients, and leading retreats, and she calls her home Harpers Ferry, West Virginia, where she lives with the love of her life, Angela Blueskies.